is the highest peak in the world. Its Tibetan meaning of 'Goddess the Third' adds more mysterious color and magic power to the subject. As a result, it has intrigued all kinds of people since it was first discovered. Pilgrims trek long distances to present a pious worship, climbing enthusiasts run great risks to challenge its high altitude and the common tourists also yearn for a reverent look at this holy peak. The altitude of Mt. Everest is now about 8,844.43 m. (29,017 ft.). 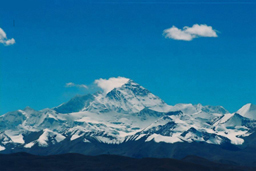 It is the dominant peak of Himalayas, the northern brae in Tingri County of Tibet and the southern in the Nepal. The area has 4 peaks above 8,000 m. (26,247 ft.) and 38 peaks above 7,000 m. (22,965 ft.), hence the laudatory title 'the Third Pole of the Earth'. As the supreme point of the world, Mt. 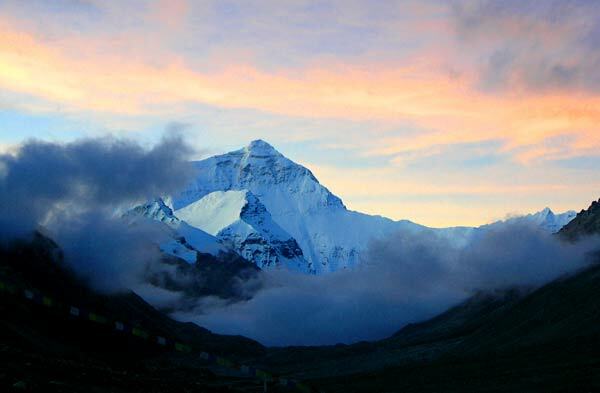 Everest is also blessed with many extreme wonders. The top part of the mountain is covered with snow all the year round. When the glaring sun shines on the mountain, the peak is just like a white pyramid miraculously transformed by the Goddess, leading us to imagine her semblance further. More often than not, the thick freely moving clouds and fogs, seeming as if a flag with the mast of the peak was swinging, will shroud the peak. This peculiar phenomenon of Mt. Everest is known as 'Flag Cloud'. An additional wonder generated here are the bright glaciers, where ices are formed into various shapes like bridges, pagodas and others. You can also find miles of efflorescent rock physiognomy there, such as stalagmites, stelae, stone sword, and stone pagodas. The climbing pathfinders call this splendor at such high attitude 'the Largest Park on the High Mountain'. The area of Mt. Everest has been built as one of the national natural reserves, wherein live thousands of kinds of plants, hundreds of varieties of wild animals and dense virgin forests. Many of these are precious and rare, like the first-class protected animal ounces and the valuable timber sandals, etc. At the foot of Mt. Everest is located the highest temple in the world, Rongbuk Monastery. At the altitude of about 5000 m. (16,404 ft.) and 25 km. (15.5 mi.) in the distance, it is also the best point to appreciate the scenery of Mt. Everest. Rongbuk Glacier around this area is also the largest among all the glaciers here. Climbing Mt. Everest is very dangerous, only those who can endure the adverse weather and experienced climbers should venture onto it's slopes. The area is frequently beset with sudden storms, snow, wind and the weather may change quickly in a day. Only the periods between early March and late May, along with early September and late October are fit for climbing, among which less than 20 days are actually fine. So keep a very close eye on the weather changes there if you want to climb. Mt. Everest lies in the borderline about 100 km. (62 mi.) south of Sino-Nepal Road, you can hire a car from Lhasa or take some vehicles by the way. For the dining and accommodation, Rongbuk Monastery is recommended.